Thanks for all your beautiful contributions and a wonderful weekend to all my guests! 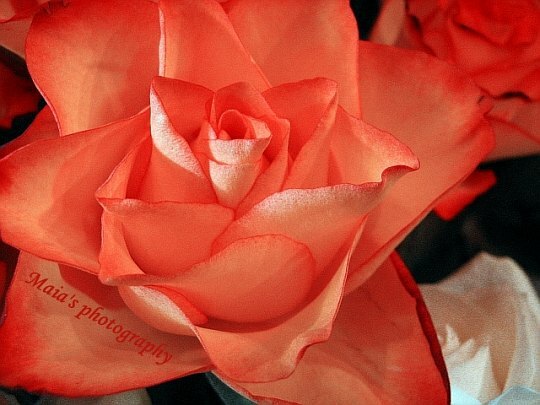 Here is a beautiful rose for you! I'm not sure about the color, is it pink, is it coral? Such a great rose - I love the colour very much! That's an amazing colour of rose - I would say from the look on my computer screen that it's coral in colour. It looks like red orange to me. Roses are timeless beauties! Whatever the color is, is just beautiful! Just fantastic! i loved it. The color is incredible and I would say it is a peach coral. Wow! sheer perfection. love the rich outlines of this rose. Isn't it fabulous how beautiful roses are? Just wonderful! My own 'wintry' bloom looks so cold compared to the colorful blossoms. gorgeous take on the rose. Nothing more beautiful than the natural symmetry on roses. The petals are so silky. I think the color is leaning towards coral rose. I love the center of this rose! What a lovely rose - I can almost smell it! Have a great weekend! whew! that is so beautiful!!! Such a gorgeous colour. It is an orange red on my screen. Very beautiful, but I would call it orange or apricot, not pink. But browsers are different! Lovely shot.